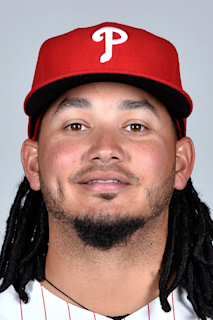 Freddy Jose Galvis ... Nicknamed Taco ... Is a 2006 graduate of Unidad Educativa San Francisco Javier, where he played baseball, basketball and soccer ... Originally signed as an international free agent by Phillies' scouts Sal Agostinelli and Jesús Méndez on Juy 2, 2006 ... Is married to Ana Beatriz Solano and has two daughters, Anastasia Isabel and Nicole Montserrat ... Hobbies include playing basketball, soccer and going to the beach…Favourite TV show is Friends and his all-time favorite baseball player is Omar Vizquel...Also roots for FC Barcelona. Played in all 162 games for the second consecutive season ... Has appeared in 325 consecutive games, the longest streak in the Majors among active players ... His 1,441.0 innings in the field in 2018 were the most in the Majors...His 162 starts also topped MLB ... Set a personal best with 31 doubles and tied career highs with 49 extra-base hits (2016), 67 RBI (2016) and 45 walks (2017) ... Ranked 2nd among all shortstops in fielding percentage (.986), putouts (222), 3rd in total chances (630), tied for 6th in assists (399) and 7th in double plays turned (80) ... Led the Padres in bunt hits (six), infield hits (18) and four-hit games (three), ranked tied for the club lead in doubles (31), second in hits (149), runs (62), at-bats (602), walks (45), multi-hit games (41), triples (five), total bases (229) and wOBA (.303) and 3rd in RBI (67) and extra-base hits (49) ... With his 13 home runs, he joined Khalil Greene (four times from 2004-2007) as the only Padre shortstop to hit at least 13 homers in a single season ... Had a team-leading 12 hits in his first 10 games (.364 average), good for third-most hits by any shortstop in Padres history through 10 games of a season... Only Tony Fernandez (15 hits in 1991) and Enzo Hernandez (13 hits in 1971) had more ... Hit first in the batting order on 18 occasions, and hit .321 (26-for-81) in those at-bats ... Reached base safely via hit or walk in all 12 games to start the season, the longest such streak to start a season by a Padre since Chris Denorfia in 2013 (14 games)…Reached base in 16-straight games dating back to Sept. 26, 2017, the longest on-base streak of his career ... Recorded a career-high five hits on June 15 at ATL, including a three-run HR and a double ... Logged multi-hit efforts in four consecutive games from Aug. 23-26, the 2nd-longest streak by a Padre in 2018 (Eric Hosmer-5G from April 28-May 2) ... Went 4-for-5 on both Sept. 18 vs. SF and Sept. 25 at SF, resulting in his 2nd and 3rd four-hit outings of the 2018 campaign... Prior to this season, had just one career four-hit game (Sept. 7, 2013 vs. ATL while with PHI) ... As a right-handed hitter, he slashed .291/.323/.455 with 15 doubles, two triples, four HR and 17 RBI…As a left-handed hitter, he hit .228/.289./.346 with 16 doubles, three triples, nine HR and 50 RBI ... Went 24-for-59 (.407) with seven doubles, a triple and two home runs over his last 14 games, including eight multi-hit efforts. Made his third consecutive Opening Day start and fourth overall...was one of five MLB players to play in all 162 games in 2017... Joined Larry Bowa (1974) and Jimmy Rollins (2007) as one of three players, whose primary career position was shortstop, to appear in all 162 games for the Phillies (Bowa started 161, Rollins started 162 and Galvis started 155)…Galvis also become just the 11th different Phillies player to do so in franchise history, the first since Ryan Howard in 2008...he also made one start in center field... Galvis was also one of just five MLB players to have played in all 162 games in 2017 (also: KC's Alcides Escobar and Eric Hosmer, TEX's Rougned Odor and CIN's Joey Votto... His .989 fielding percentage led all MLB shortstops, committing just seven errors all season... Defensively, he also led all NL shortstops in starts (155) and innings (1359.1) and ranked second in total chances (637) and putouts (226) and third in assists (404)... Among NL shortstops offensively, he ranked first in at-bats (608) and multi-hit games (44), second in hits (155), third in total bases (232), tied for third in triples (six), fifth in doubles (29) and runs scored (71), sixth in RBI (61) and tied for sixth in extra-base hits (47)... His six bunt hits were the fourth-most among all NL players... Led PHI in games, at-bats (608), hits and multi-hit games (44)... Established career highs in games, runs (71), hits, doubles (29), triples, walks (45) and HBP (4)... Started each of the Phillies' first 140 games, the longest streak of consecutive starts by a Phillie since Jimmy Rollins (230 games, 7/30/06-4/8/08)... Started in center field on 8/30 vs. ATL (game two), his 1st ML start in center and first outfield start since 2013 (10 GS in LF)...his prior 286 starts had come at shortstop... Had a career-best 13-game hitting streak from 4/16-5/1... Collected his 500th career hit on 8/3 at LAA... Had the first two multi-home run games of his career (6/4 vs. SF and 7/9 vs. SD)... Became the fourth Phillie to homer from both sides of the plate (6/4 vs. SF) and first since 7/20/11 (Jimmy Rollins at CHC)... Set a career high with 10 assists on 5/23 vs. COL... Selected as the Phillies' recipient for the MLB Players Alumni Association 2017 Heart and Hustle Award, presented annually to an active player who demonstrates a passion for the game of baseball and best embodies the values, spirit and traditions of the game. In spring training, led the team in AB (82), total bases(39), triples (3), RBI (14) & SF (3) and tied for the teamlead in hits (23) and sacrifices (2); also switched from SSto 2nd base... Was the Phillies' Opening Day 2nd baseman... Made his ML debut on Opening Day, 4/5 at PIT,becoming the first Phillie to make his ML debut onOpening Day since 1970, when Larry Bowa (SS) andDenny Doyle (2B) did it... Collected his 1st ML hit and RBI, 4/9 vs FLA (2-run double)... Slugged his 1st ML HR, 4/13 vs NYM (R.A. Dickey)... Was placed on the 15-day DL on 6/7 (pars fracture of L4-5 vertebrae)... At the time of being placed on the DL, was tied for themost games played in MLB (58), was leading the team indoubles (15) and had the 2nd-best fielding % among NL2nd basemen... While on the DL, was given a 50-game suspension on6/19 for violating Major League Baseball's Joint DrugPrevention and Treatment Program after testing positivefor a metabolite of Clostebol... Was reinstated from the restricted list on 8/17 andremained on the DL... Made 45 starts at 2nd base and 4 at SS. Won the Paul Owens Award as the best player in the Phillies minor league system...Reached pro highs in runs (78), doubles (28), triples (5), HR (8) and SB (23)...Was a non-roster invitee to Phillies spring training...Began the season with Reading (AA)...Named to the Eastern League midseason All-Star team...Promoted to Lehigh Valley (AAA) on 8/2...In 33 games with Lehigh Valley, had 10 infield hits, including 5 bunt singles...Batted .250 (6-24) in 7 International League playoff games. Began the season with Clearwater (A)...Named Phillies Minor League Player of the Week,4/20-26 (.417, 10-24, 5 R, 4 SB)...Had a season-high 4 hits, 4/26 at Tampa...Was on the DL with a fractured right ring finger,5/7-7/17...Appeared in 7 games with the Gulf Coast League Phillies (R), 7/9-16...Was transferred to Reading (AA) on 8/24 where hefinished the season. Spent the season with Lakewood (A)...Named to the South Atlantic League postseason All-Star team...Hit .313 (31-99), 14 RBI in 28 games in May...Went 5-for-5, 3 RBI, 7/21 at Asheville...Participated in Florida Instructional League. Began pro career with Williamsport (A). January 29, 2019 Toronto Blue Jays signed free agent SS Freddy Galvis. October 29, 2018 SS Freddy Galvis elected free agency. December 15, 2017 Philadelphia Phillies traded SS Freddy Galvis to San Diego Padres for RHP Enyel De Los Santos. January 30, 2017 2B Freddy Galvis assigned to Venezuela. October 23, 2014 2B Freddy Galvis assigned to Aguilas del Zulia. August 23, 2014 Philadelphia Phillies recalled SS Freddy Galvis from Lehigh Valley IronPigs. July 19, 2014 2B Freddy Galvis assigned to Lehigh Valley IronPigs from Clearwater Threshers. July 16, 2014 2B Freddy Galvis assigned to Clearwater Threshers from Lehigh Valley IronPigs. July 9, 2014 sent 2B Freddy Galvis on a rehab assignment to GCL Phillies. May 9, 2014 Philadelphia Phillies optioned 2B Freddy Galvis to Lehigh Valley IronPigs. April 11, 2014 Freddy Galvis roster status changed by Philadelphia Phillies. April 8, 2014 Philadelphia Phillies sent 2B Freddy Galvis on a rehab assignment to Clearwater Threshers. September 3, 2013 Philadelphia Phillies recalled 2B Freddy Galvis from Lehigh Valley IronPigs. June 28, 2013 Philadelphia Phillies optioned Freddy Galvis to Lehigh Valley IronPigs. April 10, 2013 2B Freddy Galvis assigned to Lehigh Valley IronPigs. October 5, 2012 Freddy Galvis roster status changed by Philadelphia Phillies. August 17, 2012 Philadelphia Phillies placed 2B Freddy Galvis on the 15-day disabled list. June 19, 2012 Philadelphia Phillies placed 2B Freddy Galvis on the restricted list. June 7, 2012 Philadelphia Phillies placed 2B Freddy Galvis on the 15-day disabled list. Lower back strain. October 11, 2011 SS Freddy Galvis assigned to Aguilas del Zulia. October 10, 2011 Philadelphia Phillies activated 2B Freddy Galvis. August 2, 2011 SS Freddy Galvis assigned to Lehigh Valley IronPigs from Reading Phillies. March 18, 2011 Philadelphia Phillies optioned Freddy Galvis to Reading Phillies. November 19, 2010 Philadelphia Phillies selected the contract of Freddy Galvis from Reading Phillies. October 8, 2010 SS Freddy Galvis assigned to Navegantes del Magallanes. January 7, 2010 Philadelphia Phillies invited non-roster SS Freddy Galvis to spring training. August 24, 2009 Freddy Galvis assigned to Reading Phillies from Clearwater Threshers. July 17, 2009 Freddy Galvis roster status changed by Clearwater Threshers. July 9, 2009 sent SS Freddy Galvis on a rehab assignment to GCL Phillies. May 7, 2009 Clearwater Threshers placed SS Freddy Galvis on the 7-day disabled list.